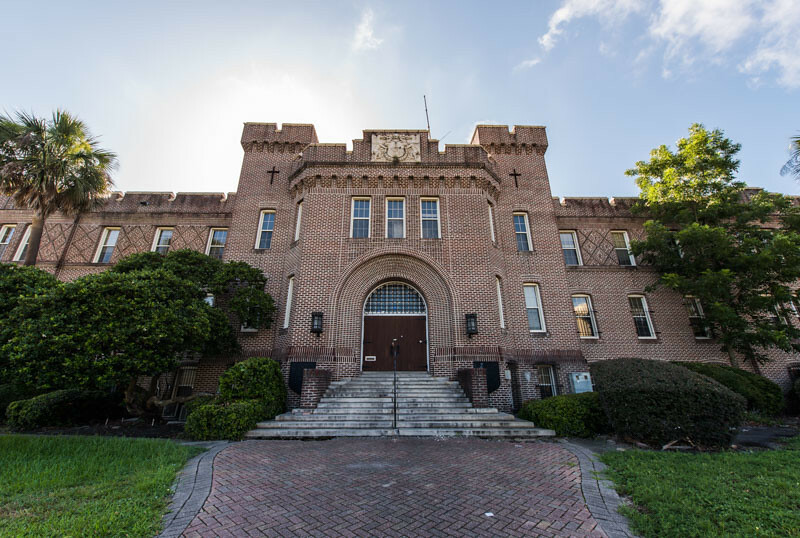 Located at 851 North Market Street and sandwiched between Hogans Creek and State Street at 851 North Market Street, the Gothic Revival-style Duval County Armory was completed in 1916. Constructed at the cost of $150,000 to replace an armory destroyed in the Great Fire of 1901, the building was designed by Wilbur B. Talley. One of the founders of the American Institute of Architects (AIA) Florida, Talley was a prominent Jacksonville architect who relocated to Lakeland, FL after his wife and daughter were killed in a train accident in 1919. In addition to serving the military reserve force, it became the city’s primary destination for dances, cultural events, high school graduations and concerts after its completion. A social beehive of activity, the Armory’s spaces included a kitchen, mess hall, band room, billiard room, rifle range, swimming pool and bowling alley. It was also the state’s largest drill hall. Major events at the Armory included a 1936 speech by First lady Eleanor Roosevelt, performances by Duke Ellington and Ray Charles in the 1950s and 60s , the debut concert by the Allman Brothers Bank on March 30, 1969 and one of the final concerts by Janis Joplin in early 1970. Despite hosting major events through 1970, the venue’s usage steadily declined with the openings of the George Washington Auditorium (1941), Jacksonville Coliseum (1960) and the Civic Auditorium (1962) in downtown. In 1973, after being replaced with a new armory on the city’s westside in 1972, the building became the City of Jacksonville’s parks and recreation department. In 2010, the parks and recreation department relocated to the Ed Ball Building, leaving the building abandoned for the first time in its history. Despite controversial proposals in 2012 and 2013, calling for its conversion into a homeless shelter and a Sons of Confederacy museum. the stately structure remains vacant six years after the parks and recreation department’s relocation.